Some of our readers are familiar with Lovecraftian horror. My introduction to the literature came around the age 15-16, meaning 1977-ish. 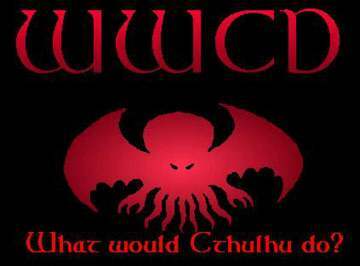 Within a few years my only “gang” and I played a little Call of Cthulhu sometimes, as a break from the usual AD&D. Anyway, the following thought-chain occurred: my Army officemate’s computer suddenly played Reveille. That reminded me of Boogie-Woogie Bugle Boy, which I played on YouTube, which then offered other old song clips including Chattanooga Choo-Choo, which reminded me of THIS. Yes…that. If you’ve read Lovecraft, you’ll see just how brilliant a song parody it is. Even accounting for the misspelling of “Tcho-tcho” (which may be the transcriber’s fault, not the song-writer’s) it’s one of the best I’ve seen. No doubt it’s been performed at SF conventions; wish I’d been at one of those. Oh well.